Ever go out and eat something really fancy that really tantalizes your taste buds? We’re not just taking about all those fancy food recipes out there, sometimes just some good old comfort fast food. ‘Cook Like a Pro’ — an exclusive project by ProPakistani – where we bring you the best restaurant dishes that you can now easily prepare at home. These recipes will guide you and ultimately help you recreate your favorite dish. 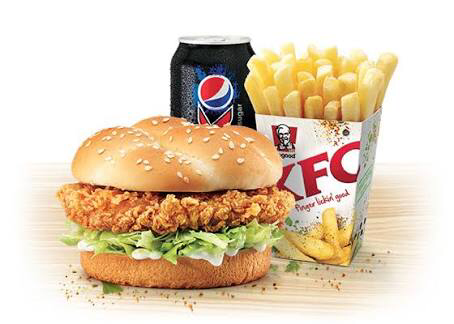 We bring you one of the most famous and most loved food item everywhere whether its kids, adults or teens -we’ve brought to you the exclusive recipe of KFC Zinger Burger. When you say the name of fast food, only a handful of names pop into your head and KFC is one of them. The franchise, renowned for its chicken-related meals, has been around for a number of years and is adored by many people. This week, we will learn about how to recreate the juicy burger, which we all love to eat. Fun Fact: Did you know the trick to a good, juicy and tender burger lies in the Chicken leg? yes you heard us correctly- Not the chicken breast piece but instead the chicken leg itself, which is why we’re using that here. Take the Leg Quarters and separate the boneless meat from each quarter- being careful to keep the meat in one piece. Place Garlic Paste, vinegar, salt, crushed red chili and white pepper powder in a separate bowl. Marinate the boneless chicken with these ingredients. Add just enough buttermilk to soak the boneless chicken. If you’re using buttermilk substitute then mix lemon/vinegar with milk, allowing it to sit for 5 minutes until it curdles and becomes acidic, then it’s ready to use! Place Marinated chicken in the fridge for a minimum of 1 hour. It is better if kept overnight. Fun Fact: Did you know buttermilk is used to brine chicken? It tenderizes the meat and gives a delicious creamy flavor. Add Flour, Cornflour, Salt, Black Pepper Powder and the beaten egg into a separate bowl, mix these ingredients up and add a little water to make the batter. Make sure you don’t add too much water, the batter shouldn’t be too thin or too thick. In another bowl add the Flour, Salt, White Pepper Powder and mix well. Take the chicken out of the refrigerator and shake off as much of the butter milk as possible. Then dip the chicken into the batter you previously prepared, making sure the chicken is well coated. Then place batter coated chicken into your flour mixture and coat well. Repeat this process twice by dipping back into the batter and then into the flour coating again. Heat oil in a large deep pan or wok. Know the oil is hot enough: place a piece of the coating if it sizzles to the touch of the oil, know it’s ready to use! Deep fry the chicken until it’s golden brown. This should take around 10 to 12 minutes. Drain the excess oil by placing the chicken onto a tissue paper or wire rack. Toast Buns on a large skillet on medium heat, being careful not to brown or burn the buns. Apply mayonnaise on the bottom bun, then place the lettuce leaf. Place the fried chicken over the lettuce. Top chicken with a slice of cheese. Add more mayonnaise on top, then sandwich with the top bun and you’re done! Be sure to try out these recipes and leave your suggestions in the comments below and tell us which famous dish you want ‘Cook Like a Pro’ to share with you. ProZuabia Apa…Youtube pr bharmar hai innki plz yahan nh. mey ney bahrain mey ju kfc khaya hey wo buhat diffrent hey yaha sey..
or cole saw salad mey zameen asmaan ka farak hey. Moreover Pakistani kfc is not the real KFC . Some Karachi based group has taken rights for using KFC name from the global chain. dear readers, junk food post brings junk of web traffic. Toasted bun? Lettuce and mayonnaise? This is just another desi zinger knockoff sold at every corner joint. Anyone can make the patty, but the key to a true zinger lies in the bun, the sauce and the dressing. It looks delicious I will try.